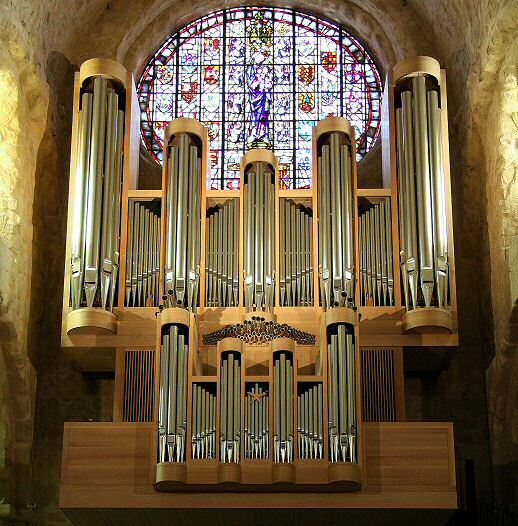 Description: The renowned European organ building company, Metzler Orgelbau AG, which has been flourishing in Switzerland since 1890, built one of its largest instruments for the Poblet Monastery. It consists of three manuals and 56 stops. Metzler has always built their instruments to last. For this reason they have studied historical organs throughout the continent to "relearn" the old master's organ building trade. Furthermore they only use the finest natural materials that have proved their value throughout the centuries. The new Poblet organ, which is not a copy of a certain style, but was conceived as a balanced synthesis of the most important elements of European Baroque and Classical organ schools, is a truly interregional style instrument while being as authentic and accurate as possible to the original examples. The tonal conception is based on the German Baroque style, centred in the music of J. S. Bach. However the instrument also includes bright French and Spanish reeds, as well as mutations and fonds, the necessary elements for the interpretation of French, Iberian, Late Baroque, Romantic and modern music. The voicing and tonal finishing was done by Andreas Metzler in consultation with the Abbey's main organist, Fr. Josep Antoni Peramos. Concert organists from all over the world are now playing concerts in Poblet and are fascinated by the richness and beauty of the instrument's sound and the excellent mechanical tracker action, which allows easy coupling of all manuals. The Abbey church has a reverberation time up to 7 seconds.